1. 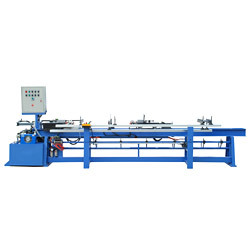 TL-159 hydraulic tube stretching machines are used to stretch tubes with different length to equal length. 2. Advanced technology which cuts the cost. 3. Hydraulic stretching, stable quality. 4. PLC automatic controlled, easy to operate. (1) Power supply: triphase 380V, 50Hz, 3.8KW. (2) Air supply: 5 ~ 7 kg/cm2. (3) Applicable tube diameter: Φ6mm ~ Φ16mm (over this range can be custom-made). (5) Efficiency: 5000 pcs /8h. (6) Size (L x W x H): 4600 x 1000 x 1650(mm). (6) Size(L x W x H): 4600 x 1200 x 1650(mm).